It’s safe to say that Shambolics are not ones to boast about their achievements, given their response to being asked about their success at the Scottish Alternative Music Awards. 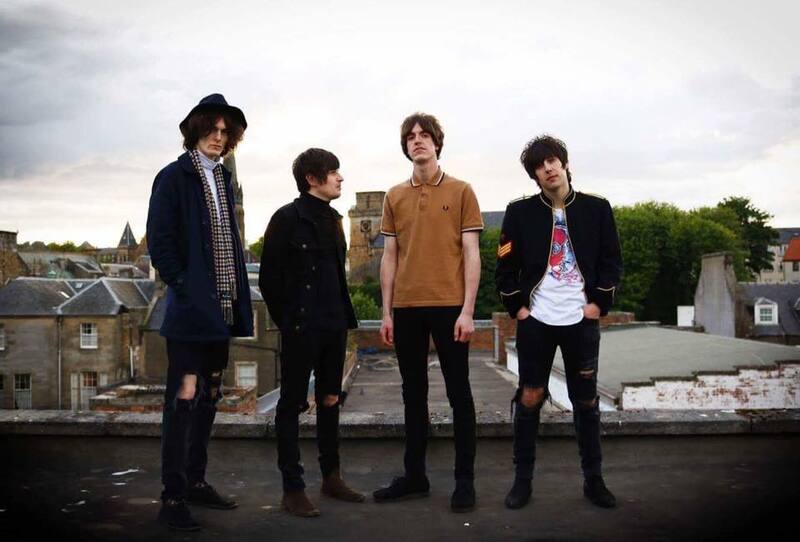 Self-proclaimed “dreamy rock’n’roll” four-piece hailing from Fife, the band are more than happy to supply Hearing Aid with relaxed and open conversation following a Wednesday night practice at Eggman Studios in their hometown of Dunfermline. Having come together just two years ago, the group have progressed through the Scottish music scene at an impressive rate, most recently marked in scooping Best Rock/ Alternative Award at the SAMA Awards in early October. Priding themselves on coming from “absolutely nothing” in terms of management or publicity, the band really have worked their way up from scratch. The boys openly recount their early profile-raising methods ranging from endless touring across Scotland and Manchester to crowds as small as six people to spending hours selling CDs outside the entrance of a Noel Gallagher gig in Glasgow. Their integrity clearly paid off, and further fuelled by their charismatic optimism and stand-out sound, the band can pride themselves on having become a forerunner in Scotland’s indie-rock scene, selling out across the country and enjoying a Facebook following of close to 3500 likes. When questioned about their experience of meeting other “emerging talents” from across the country at the SAMA awards ceremony, the group replied that they had already encountered many of the acts beforehand, largely due to the small scale of the Scottish independent music scene. Navigating such a small network has proved to be both a blessing and a curse; ever humble and unassuming, they claim that having less competition has helped in contributing to their success, but on the flip side can be a limiting factor in terms of exposure to opportunity, and the band express an interest in making the move down to London in future as their success continues to grow. Despite their desire to travel wherever their music takes them, a shared nostalgia in reverie of their home gigs displays a firm attachment to their origins. Whilst the group appreciate the tranquillity of London crowds who “really listen” to their performances, the special atmosphere encountered while playing locally is a very different experience to that found south of the border, namely down to Scottish guests’ unique ability to really let loose and have a great time, Buckfast in hand, consistently enabling the perfect environment for a good old rock’n’roll boogie. Their in-keeping carefree, upbeat attitude shines through in the group’s latest track, Chasing A Disaster, released in September. Whilst displaying a slight shift into more pop-dominated territory than definitively indie-rock earlier tracks Scartlett Harlott and Love Collides, the group stay true to their roots and original rock influences with psychedelic guitar riffs reminiscent of The Stone Roses’ early works such as Elephant Stone. A sense of loyalty to their roots is further emphasised with prevalent accents of vocalists Lewis McDonald and Darren Forbes in Chasing A Disaster nodding toward other renowned Scottish artists The View and The Jesus & Mary Chain, and provides listeners with a constant reminder of the band’s origins. Shambolics succeed in being simultaneously a product of 2010s indie scene and at the same time appear to transcend any era. They consequently hold an intrinsically timeless quality both in their music and aesthetic, somehow managing both to maintain classic characteristics and do completely their own thing. When asked to describe what influences their idiosyncratic appearance, the members throw out vague terms like “hippie”, “punky” and “70s style”. This self-analysis by the group can equally be applied to their sound – inflections of their idols Stone Roses, The Beatles and Oasis can certainly be detected in their music, but at the same time these influences have been interpreted and injected with the band’s original and innovative approach towards blending the genres of their artistic influences. The winter months certainly won’t be slow ones for the group, as they set off on tour with two London dates lined up in November and the best Christmas present fans could ask for as the band return to play in PJ Malloys in Dunfermline for their home fanbase on the 22nd December in a sure to be sell out event.